That probably depends on how we define trust to begin with. For our purposes, it’s a choice to rely on someone else’s actions in hopes that they bring a desired outcome. So when we trust a brand, we choose to believe that they want to provide its customers a desirable experience with our interactions with that brand. That desirable experience might mean having proper protections in place for you data, having servers up and running without malicious intent, pricing in game items at a level commensurate with their purpose or need. Things like that. 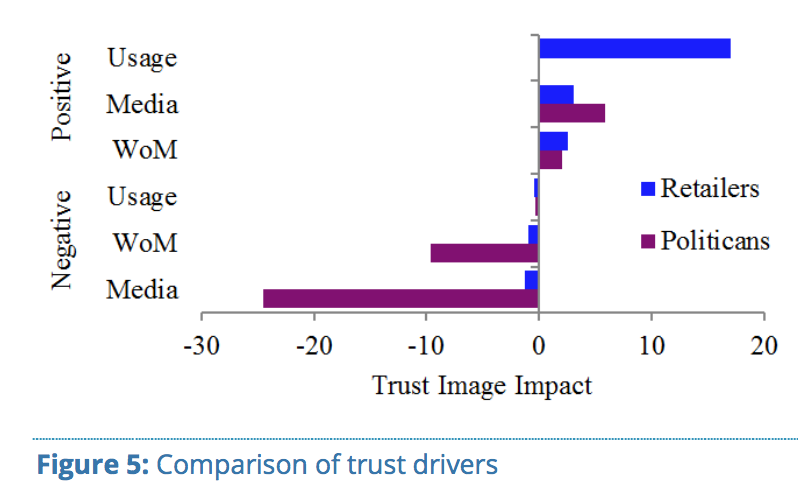 Trust is viewed much differently depending on what we’re talking about. Brands and the industries that they’re tied to garner a different level of descriptions like “honest”, “caring” and “trustworthy”. All industries have varying levels of Brand Trust with consumers. Many of them in the chart above make some sense. 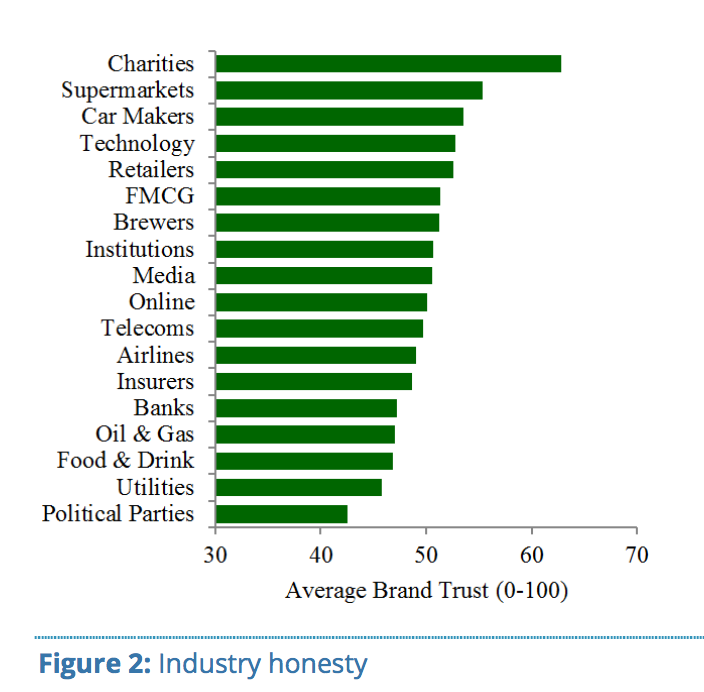 Charities are seen as more trustworthy than Political Parties, but why would supermarkets or car makers be more trustworthy than airlines or banks? We do hear a lot of bad publicity from airlines and banks but we also hear a lot of bad press about car makers, so why are the discrepency? The answer really depends on how we interact with products of each industry and how new information about products from that industry affect our perception of that industry. In general, the more often we interact with a brand with good experiences, then our perceptions of that brand are affected less by bad news. 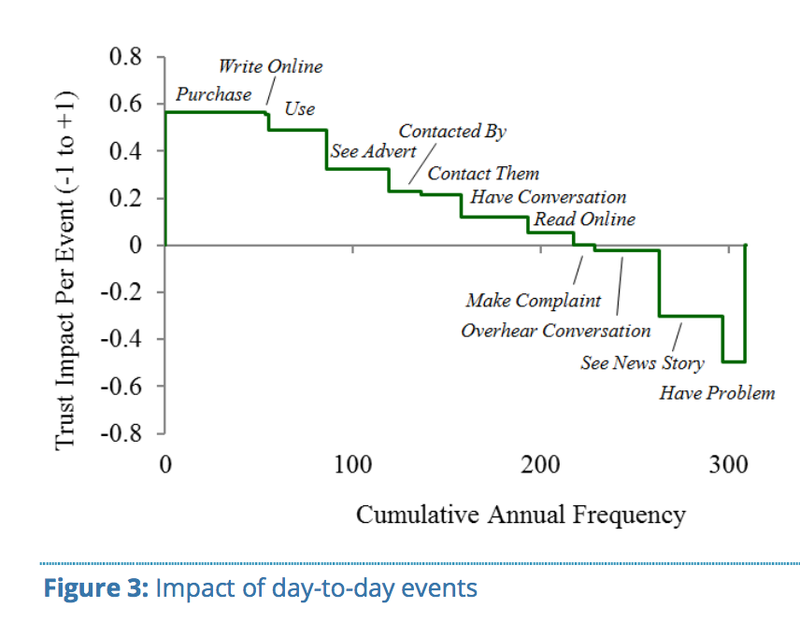 Interactions, both good and bad, come from things like press coverage, usage, word of mouth, and customer service experiences. Not all interactions are weighed equally, though. 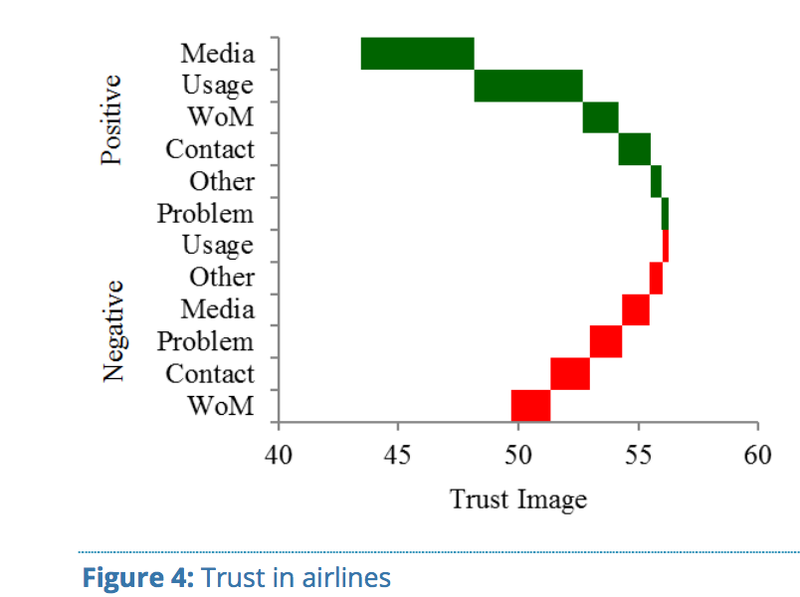 In the chart above, the fact that you spent your money to buy something and use a product plays a large roll in positively viewing that brand but the more bad interactions occur and the less good interactions occur because of infrequent use means that it’ll be much easier to fall into a pit of low Brand Trust. For airlines, because we are on them so infrequently, they have a large bias to surpass where flight delays, lost luggage and bad customer service experiences color our perception more than bad experiences with, say, a supermarket. If you think of it as a numbers game, we go to the supermarket once a week but go to the airport maybe once-twice a month for business travelers (which most people are not) and twice a year for normal vacation travel (which is far more likely). And the duration of a bad experience with an airline lasts quite a long time as it ruins your vacation, your flight and your plans. To illustrate the effect of frequent vs infrequent use, take for example Retailers vs Politicians. We deal with retailers daily/weekly but politicians once every 2-4 years (in the US) so Politicians are easily ruined by bad press and impressions. One way to think about it is if you deal with someone often (Person A) and you hear something bad about them, that one piece of news is added to the stockpile of information you already have about that person. But if you hear something bad about someone (Person B) who you deal with only once in awhile, then that information plays a larger part of how you view that person. You can also hypothesize the explanation of Cognitive Dissonance  to describe this behavior. “I’m a good, rational person so if I’m always going to this retailer (driving this kind of car, playing this game) they can’t be all that bad,” so you take the news as only a blemish and not a catastrophe. The article concludes with the 4-C’s for building/maintaining Brand Trust. Complaints – How your company deals with problems. Contact – Increasing positive staff-customer interactions. Communication – Stopping Bad Press and Word of Mouth. Valve and Blizzard are well-regarded, in general, but they definitely don’t have high marks in all respects. But do they follow the 4-C’s? Let’s look at Steam, since Valve as a developer doesn’t produce a lot of games anymore though the games that they do release are always high quality (e.g. Portal, Half-Life) and have high interactions frequency (e.g. Team Fortress 2, Counter Strike, DOTA 2). Steam has an incredibly high daily user basis making it a frequently interacted with product. They deal with customer complaints well when games don’t work or are unplayable, like Batman: Arkham Knight, Earth 2066, or The Stomping Land. They produce a lot of consumer friendly features like Family Sharing, a great Recommendation System and an alright Indie/beta distribution platform. Steam also offers great sales several times a year which cause a large influx of users to deal with Steam during its high points. That being said, they don’t always have the best complaints system as sometimes there’s outright dismissals and miscommunication which led them to receiving an F in customer service from the Better Business Bureau. At best, there is mixed correspondence scattered throughout the internet about Steam’s customer service. But Stream at least takes the offensive against bad press and talked about ways of achieving a better customer service experience, though it is still in the works. Steam being the main portal to your gaming collection, having uptime, great sales, and a mixture of customer feedback, still received a 4/5 from PCMAG.com. Compare this to UPlay’s score of 1.5/5 from Softonics. In Steam’s case, high positive usage experiences helps greatly. For Blizzard games, a lot of the same things can be said. Blizzard isn’t the portal to your gaming collection nor offers a wide range of games on sale, but the games that they produce are always high quality, are well supported, and are played with high regularity. 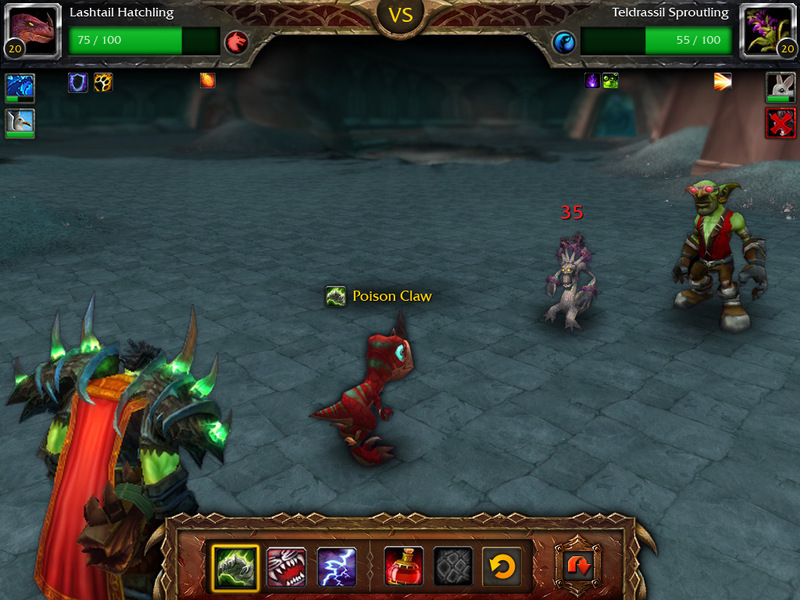 World of Warcraft with its high player base meaning you can jump in whenever you’d like and find a group to explore dungeons, raid, or play “Not Pokemon”. Starcraft 2 and Diablo 3 which have such a long time following that people still play each iteration of these franchises and still get semi-regular updates. Overwatch already touted a player base of over 10 million players as of early June for being a newly released game and has a good start for not having a toxic community which helps keep people engaged. High iteration frequency for a clean/polished product helps immensely with developing trust in their brand. How Blizzard deals with complaints, on the other hand, is something of a mixed bag as well. Poor automated responses, long response times in their ticketing system and poor interactions with users on the forums can be found across the internet, but so can the positive interactions as well. Thankfully Blizzard produces a lot of positive contact and communication with its user base with frequent posts and updates addressing recent issues about balancing in-game, patch notes so players know what to expect in upcoming updates and great community managers and press to keep people actively engaged with the positive parts of their games. Let’s start with the bad of Pokemon Go. For the first month, Niantic didn’t follow any of the right rules for building Brand Trust. The game and the experience was largely broken. There were complaints across the community about outages and how unplayable the game could be at peak hours but worse that there was little communication from Niantic or Niantic representatives to tell us why outages were happening and when to expect things to be better. It was up to the community to see that there was a new country being onboarded so expect the server to be hit with another few million users causing other players to have a broken experience. As the game became more stable, Niantic started making changes to the game and its infrastructure with little warning which caused a lot of player uproar. Making pokemon harder to catch, making throwing pokeballs harder, changing the spawn locations of poke nests, making things harder to find while simultaneously banning apps that help in finding pokemon outside of your general area like PokeMap. A lot of these changes caused considerable tension between the community and Niantic but mostly because Niantic didn’t communicate with the community about why these changes were happening. Instead the negative Word-of-Mouth and Press was circulating and Niantic did nothing to manage the situation. Apparently Nostalgia is a great Social Currency to buy time for making a better product. More recently, they at least started letting the community know why they stopped allowing things like third-party apps, but they still don’t give a lot of rationale for the in-game changes making it hard to side with them. When they did bad third-party apps (or at least made it harder for them to use the Pokemon Go framework) on August 3rd, this was when usage started to decline. Obviously the game has a lot going for it. It encourages high frequency usage by checking for pokestops in public locations and needs to be open to hatch your eggs while you walk, though it sees its peak weekly traffic on weekends, so if they can have your gameplay be polished and usable then the game will be able to start building some sustainable brand trust. But as of now, Pokemon Go doesn’t do a lot to build a trusted franchise and unless it does something about it, it will be hard to predict how future installments/updates will positively affect the game. Or maybe it’s just a cash grab at this point. While the gettin’s good, I guess.